YouTube sends notifications to the subscribers of a channel twice. First notification is sent 30 mins before the start of a live stream and then a second notification is sent when the live stream begins. If your subscribers have clicked the bell button while subscribing to your channel they will always receive these notifications. If however they are only subscribers (but have not clicked the YouTube bell button) then they will only receive notifications occasionally. i.e for some live streams they will and for some live streams they may not receive any notifications. This is determined by YouTube&apos;s own algorithms. If you want to be sure that your subscribers will receive notifications every time you have a live stream, make sure they press the bell button in YouTube. 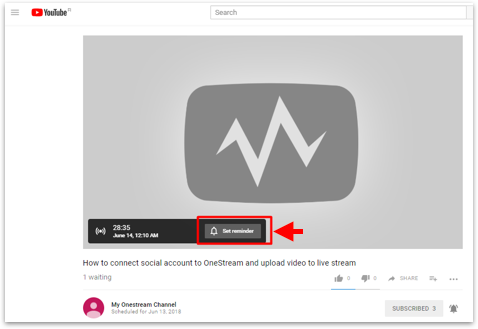 When you create a YouTube live stream via OneStream and set up a custom notification time of say 2 hour , then OneStream will create an event for you on YouTube 2 hour before the start of the live stream. ( The status of your stream goes from queued to preparing). If you click this stream in your OneStream Scheduled tab, it will take you directly to the YouTube event. You can share this URL with your followers on different social media sites like Twitter or Facebook etc. Those who click Set reminder button on the event will receive notification for this particular event 2 times. Once 30 min before the start of stream and second time when the stream begins. 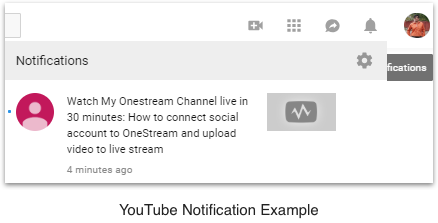 Creating a custom event notification for a YouTube video means that an event is created on your channel, at the selected time, before the start of the live stream. You can share that link to other websites and mediums to publicise your live stream and encourage users to click "Set reminder" button. It does not affect the notifications sent to YouTube channel subscribers.